Xherdan Shaqiri ready to quit? There are fears that Liverpool star player Xherdan Shaqiri will be ready to quit the Anfield anytime from now after refusing to deny he would leave the club to Italy. Although, Xherdan Shaqiri had stated that he is happy at the Merseyside club but the fact that he has no regular playing time makes it an issue that would be difficult for him to adapt to. In his interview with Gazzetta Dello Sport, the Swiss international said he has no offer yet on the table but unwittingly sang the praise Italian Serie A side Inter Milan. 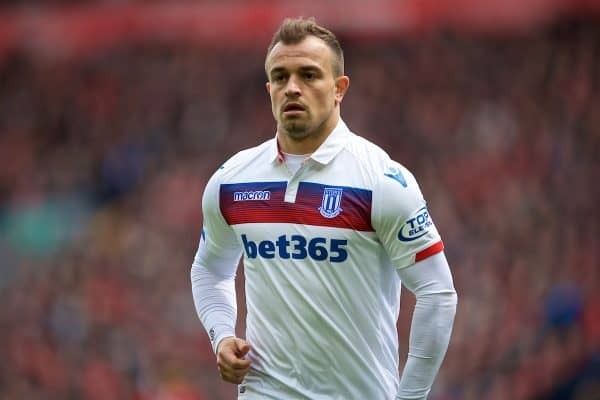 It would be recalled that Xherdan Shaqiri has a history with the Italian league having played at the San Siro before joining the now Championship League side Stoke City. Xherdan Shaqiri stated that he has some good memories of the Italian Serie A club which makes the club special to him as he added that they have got lots of quality players and history. When asked if he would seek a return back, he clearly stated that he was happy at the Anfield but noted that anything can still happen. Xherdan Shaqiri has got just nine games under his belt as a Liverpool player and has scored two goals in the process.